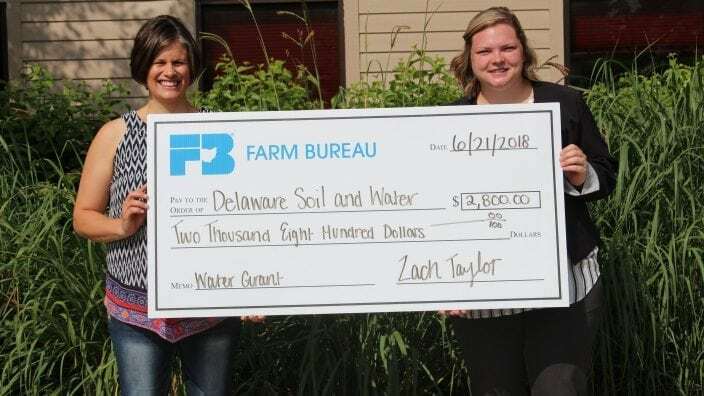 The Delaware County Soil and Water Conservation District was awarded a Water Quality Initiative Grant through the Delaware County Farm Bureau. The $2,800 grant will be aiding the Delaware Farm Tour, which will feature local conservation efforts designed to reduce soil erosion and improve water quality. The Delaware Farm Tour will be Aug. 18 from 12:30 pm to 4:30 pm. Spend a day in the country that’s both fun and educational for your family. Participants can visit any or all of the five different stops along a 32-mile route through Delaware County. The tour is an opportunity to learn about agriculture and the variety of local businesses that help make farming a prosperous industry in the county. This tour is open to the public and is free. “Each stop has unique conservation practices and activities to showcase. Families can choose to visit any or all of the stops. Additional fun and educational opportunities will be available at each stop including food samples, pedal tractor races, making fresh floral arrangements and grapevine wreaths, and petting baby farm animals,” said Dona Rhea from the Soil and Water Conservation District. Delaware Soil and Water, as well as the Delaware County Farm Bureau, would like to thank those volunteering to be this year’s hosts: Sherman Farms, Wholesome Harvest CSA & Lanum Farms, Hardscrabble Farms, Inc., Harrison Farms, Bret Davis Seeds LLC and City of Columbus’ Doutt Reservoir. Concluding the tour, participants are encouraged to attend Benefit in the Barn at the farm of Jim and Mary Rodman. This annual event is held to support local hunger relief agencies in our county. Tickets for the whole family are available online. To find more information on the Delaware Farm Tour, or get updates on planned activities, please call the Delaware Soil and Water Conservation District at 740-368-1921, or follow them on Facebook and Instagram.